Stitching together Downtown and Midtown Manhattan, this large, pulsating central plaza claims nearly two centuries of crossroads status within NYC, a thriving commercial, entertainment, public assembly, and transit hub set at the intersection (or “union”) of Broadway, 4th Avenue, and 14th Street. The namesake heart of the larger Union Square neighborhood, Union Square Park functions as much more than just a haven for recreation. Inherently designed for congregation, it's a popular and convenient meeting point that's also served as the ongoing backdrop for activism and politically minded rallies, protests, and parades throughout the years. The park is additionally a base for numerous community events, including the ever-popular, year-round Union Square Greenmarket, a farmers' market held here four times each week, as well as the well-attended annual holiday fair. Swing by to soak up the constant parade of activity and people-watching: From skateboarders to street vendors, dog walkers to demonstrators, buskers to break-dancers, Union Square Park creates a point of union, indeed, for a fascinating cross section of NYC inhabitants. 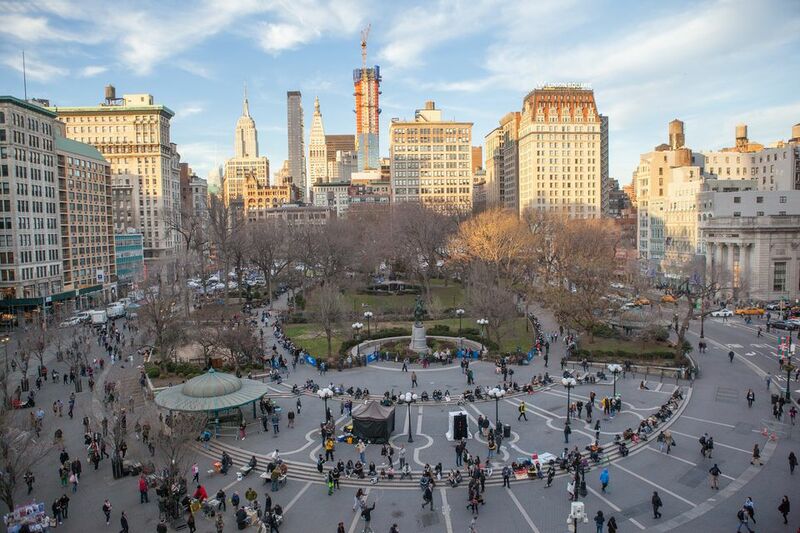 The 6.5-acre Union Square Park comes wedged between Union Square West (Broadway) and Union Square East (4th Avenue/Park Avenue South), stretching three blocks from East 14th Street on the south side to East 17th Street on the north. Anchoring the larger Union Square neighborhood, the square is infused with collegiate and creative energy thanks to the presence of nearby higher learning institutions like New York University and The New School. It’s also fringed by numerous restaurants and big-name shopping establishments, including Barnes & Noble, Whole Foods Market, and Best Buy. A major NYC subway station falls just under the park — the 14th Street–Union Square stop is accessible via the 4, 5, 6, L, N, Q, R, and W trains. Once bordered by upscale residential buildings during its 19th-century origins, Union Square Park’s perimeter eventually gave way to a long line of well-trafficked public establishments, including a string of hotels, stores, banks, office buildings, and cultural outposts (like the Rialto — the city’s first commercial theater district — which was situated on the south side of the park in the late 19th century). Officially designated public park space in 1839 (the park grounds previously served as a potter’s field for the city’s indigent), the park was revamped by landscape architects Frederick Law Olmsted and Calvert Vaux (of Central Park fame) in 1871. Along the way, Union Square Park set the stage for a massive Civil War rally in support of the Union in 1861, and then again for the country’s first Labor Day parade in 1882 (it has since been designated a National Historic Landmark due to its role the U.S. labor movement); such politically minded demonstrations continue on through to this day (more recently hosting the likes of Black Lives Matter groups). History buffs will appreciate the series of 22 bronze sidewalk plaques depicting various scenes from Union Square’s history, viewable by strolling the park’s boundaries. Apart from the historical markers fringing Union Square Park, several statues honoring distinguished world figures are sprinkled throughout the grounds. Look out for those of U.S. presidents George Washington (1856) and Abraham Lincoln (1870), French general and American Revolutionary War ally Marquis de Lafayette (1876), and Indian political leader/reformer Mohandas Gandhi (1986). There’s also the Independence Flagstaff (1926), commemorating the 150th anniversary of the signing of the Declaration of Independence, and the ornamental James Fountain, a temperance fountain dating to 1881. In the northeast corner of the park, there are a row of trees and plaque honoring the Armenian Genocide. Overlooking the square from aside a building on Union Square South, turn an eye up to glimpse the public artwork Metronome with its ever-moving LED numbers; it was installed in 1999 with an aim of abstractly depicting the passing of time. The park touts two playgrounds: One abuts the historic colonnaded pavilion (the pavilion will debut as a bocce-themed café in 2018); a second is set on Union Square’s western side, where there’s also a dog run. A large, tiered plaza at the south end of the park is a go-to spot for demonstrations. Union Square Park also offers public bathrooms and Wi-Fi access. The park’s biggest ongoing event for more than four decades is the open-air, year-round Union Square Greenmarket. Credited with revitalizing the then-declining Union Square neighborhood (the market opened in 1976), New York City’s most popular farmers’ market offers a regular hum of activity on the four days that it’s held each week – Mondays, Wednesdays, Fridays, and Saturdays. Visiting during a market day is a great way to see the park at its best and busiest, where as many as 140 (in peak season) regional farmers, bakers, artisanal food makers, and flower producers attract local foodies and chefs who come in search of farm-fresh fare. Along the park perimeters, you’ll also find stands allotted to arts and crafts vendors; while there’s a presence maintained daily, the most vendors are set up on Tuesdays, Thursdays, and Sundays. Regular programming in the park is put on by the NYC Department of Parks & Recreation and the Union Square Partnership, including free walking tours, dance classes, and more. (See the events’ calendars for the NYC Department of Parks & Recreation and Union Square Partnership for up-to-date listings.) Come summertime, the Citi Summer in the Square event brings nine weeks of free community events to Union Square Park, including music and dance performances, outdoor movie nights, kid-friendly activities, and fitness classes. Annually, mark your calendars for the fall, one-night Harvest in the Square event, showcasing signature dishes from Union Square-area eateries, paired with local wines and craft brews. Each year, the square additionally transforms into the festive Union Square Holiday Market during the winter holiday season, with more than 100 kiosks selling items from local craftsmen and artists. The park hosted a one-year public art display of American sculptor Dale Chihuly's Rose Crystal Tower; through October 2018, visitors viewed the 31-foot-tall sculpture, fashioned out of Polyvitro crystals and steel. Of course, Union Square Park's Greenmarket is a fantastic venue for stocking up on picnic-ready fare. Also within the park, the seasonal café set within the old pavilion shuttered. It was replaced by Bocce Union Square in 2018, an Italian-American bocce club that serves up games of bocce alongside food and drinks. Or, grab a bite to go from nearby supermarkets Whole Foods (4 Union Square E.) or Trader Joe’s (142 E. 14th St.). Plenty of other spots welcome quick counter-service grub, too: Try Maoz for tasty falafel (38 Union Square E.) or Wok to Walk for cooked-to-order stir-fries (42 Union Square E.). For a sit-down spot overlooking the park, casual joint The Coffee Shop (31 Union Square W.) offers sidewalk seating, Brazilian/American fare, and late-night dining, while across the street, Blue Water Grill delivers dependable seafood within an elegant old bank building.